An Ottawa document protection company has released a new version of its flagship data classification solution, with improved ways to automatically classify and protect information on the fly. Titus Inc. said Tuesday its Classification Suite 4 for Windows has a new flexible policy engine that can apply complex rules to protect information without getting in the way of business process or requiring users to remember specific security policies. 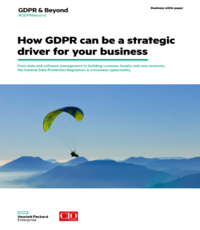 Data classification is an essential part of an IT security strategy for regulated industries as well as for organization who aren’t regulated but have sensitive data. 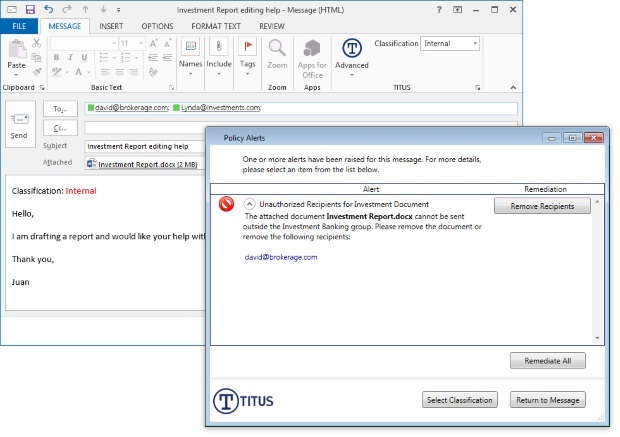 Titus said with the new version of the suite administrators can set up policies to, for example, classify email based on recipients; protect email based on the content or classification of attachments; classify and protect documents based on content, filename or location; or prevent printing of sensitive documents to non-secure printers. Customizable alerts warn users of special information handling conditions or possible impending security violations. Improvements include the ability to integrate with third party data loss prevention solutions, including Intel’s Security Data Exchange Layer (DXL). “The data sensitivity and user activity context that Titus provides to other integrated solutions within the DXL ecosystem can provide critical insights to help detect real insider threats as they happen,” Tom Fountain, Intel Security’s senior vice-president of strategy and corporate development, said in a statement. “Titus is proud to deliver a solution that we have worked toward with the input of hundreds of customers over the last 10 years,” company founder and CEO Tim Upton said in a release. Classification Suite 4 includes Titus Message Classification for Microsoft Outlook, Classification for Microsoft Office, and Classification for Desktop.